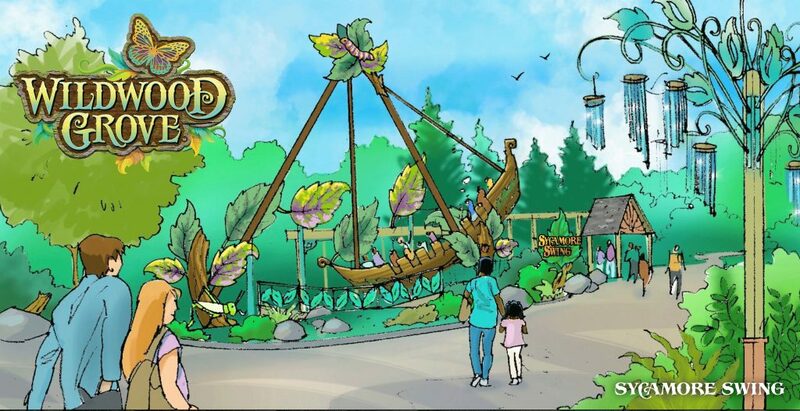 Wildwood Grove, Dollywood’s newest theme park area, is coming in 2019! We have been waiting to find out what Dolly had planned for the area that has been undergoing a lot of construction lately, and Friday’s announcement made us even more excited! Step back into time and explore the area that Dolly Parton so fondly remembers growing up. Where family memories are cherished and created set to one of the country’s most picturesque places, the Great Smoky Mountains! 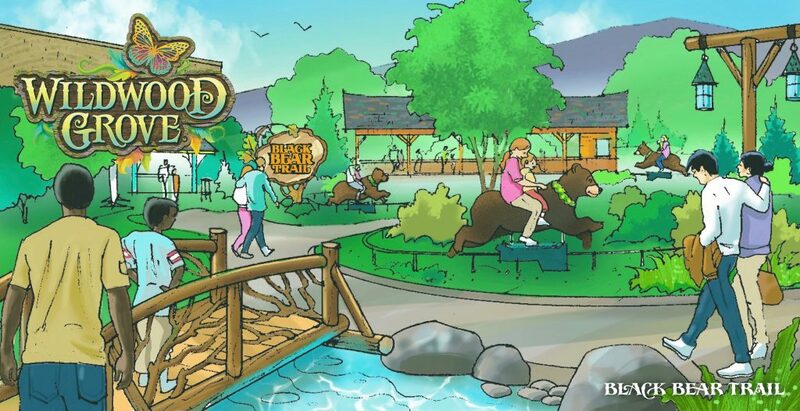 This impressive expansion, Wildwood Grove, will be the largest capital investment in Dollywood’s 32-year history. Slated to open in 2019, it will provide an adventurous journey for guests to explore, imagine and play together as a family. 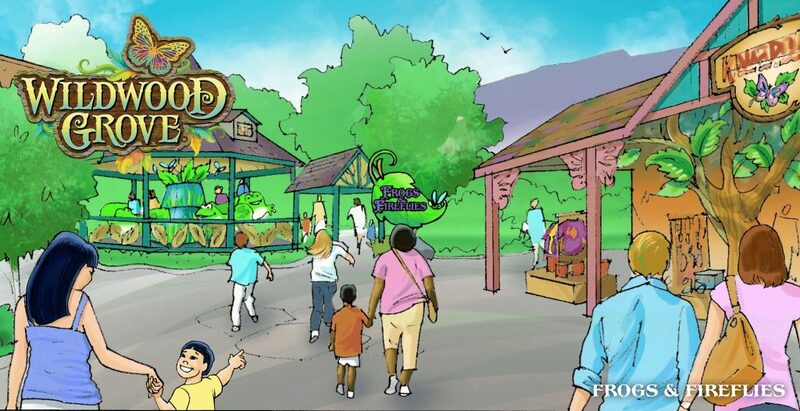 The extraordinary new land will feature 11 thrilling experiences for guests, comprised of six unique ride attractions—including a suspended family roller coaster called The Dragonflier— the 55 ft. tall Wildwood Tree, live entertainment, various indoor and outdoor play areas for families to enjoy, a new restaurant and more. The total cost for the project is $37 million, meeting The Dollywood Company’s 2013 commitment of $300 million in investments over a 10 year period four years ahead of schedule. 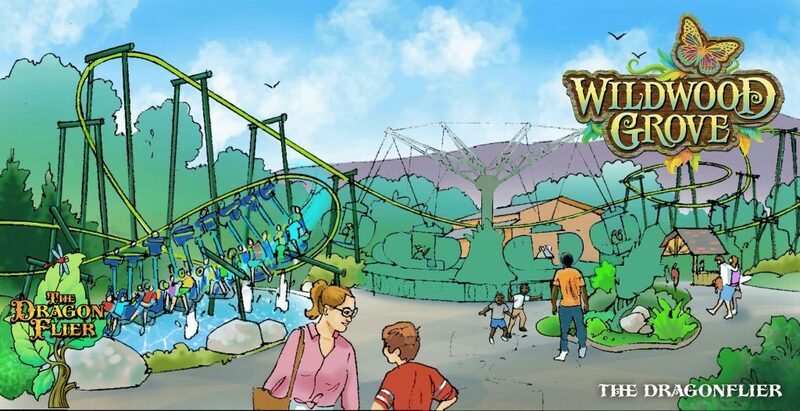 “I think our guests are going to be excited about the diverse combination of attractions they will find in Wildwood Grove,” Ross said. “It continues our commitment to provide guests with a variety of unique experiences and attractions that every visitor to the park can enjoy. We’ve also incorporated many of their requests for certain amenities that help make their visit more enjoyable. 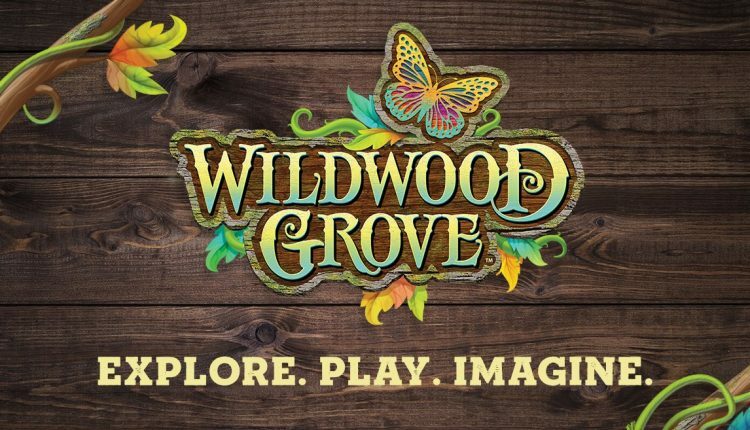 In Wildwood Grove, you’ll find more charging stations, a climate-controlled indoor space for play, larger respite locations, additional play areas which are more inclusive for everyone, and more entertainment opportunities for every member of the family. · The Dragonflier— This thrilling suspended roller coaster lets guests soar with a dragonfly as it dips and darts along the gushing geysers and lush landscape of Wildwood Grove. · Black Bear Trail— Riders hop on the back of these friendly bears for a spirited trek through their natural habitat. Families will enjoy meandering through the woods of this unique Smoky Mountain experience. · Sycamore Swing— Guests aboard this thrilling “leaf boat” swing back and forth just like a leaf falling from a giant sycamore tree. · Treetop Tower— This family tower gives guests a sky-high view of Wildwood Grove as they soar nearly 40 feet in the air. Riders, seated inside giant acorns, spin around the top of a tall oak tree before gently drifting back to the grove floor. · The Mad Mockingbird— Tennessee’s state bird—the mockingbird—gives visitors a lift as it flies in a high speed circle around a tall tree. Riders control their ride experience by moving a sail as the birds rush above the ground. · Frogs and Fireflies—These friendly frogs hop up and down as they chase each other around the lily pad trying to catch the flickering fireflies fluttering from the tall reeds and grasses. Adventurous guests can hop aboard for this riveting race. While Wildwood Grove opens in 2019, Dollywood guests still have great festivals to enjoy during 2018’s Season of Showstoppers. Dollywood’s Harvest Festival presented by Humana (Sept. 28-Nov. 3) features the return of Great Pumpkin LumiNights—which doubles in size in 2018—as well as the largest Southern gospel celebration in the world. The season ends with the 10-time winner for Best Christmas Event, Dollywood’s Smoky Mountain Christmas presented by Humana (Nov. 10- Jan. 5). This year, Wilderness Pass transforms into Glacier Ridge, a winter wonderland complete with a 50 ft. tall video motion Christmas tree. For more information about Dollywood, please visit www.dollywood.com, call 1-800-DOLLYWOOD or download the Dollywood App. Zaxby’s – It’s the Perfect Stop on a Road Trip! Sounds like a great place to visit! My kids would love the roller coasters. Have to add it to our travel bucket list. We pass through Nashville all the time but have never stopped at Dollywood. Really need to and this new area looks like the perfect reason! How come I have not heard of this?! Dollywood is about an hour away from where I live! My children would really enjoy going to Wildwood Grove! I did know about this awesome expansion. My parents have been there and my sister and her family were just there in June. It's on our bucket list to try for next summer! 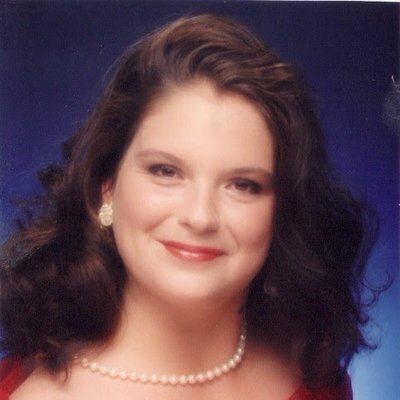 Wow, I had no idea that Dollywood had different areas / themes within the park. This new section looks like it will be awesome, I think I will have to make it a point to bring the family out there one day in the future to check it all out!